While November employment gains fell short of expectations, totaling just 39,000 jobs during the month, the private sector maintained positive momentum with a contribution of 50,000 positions. 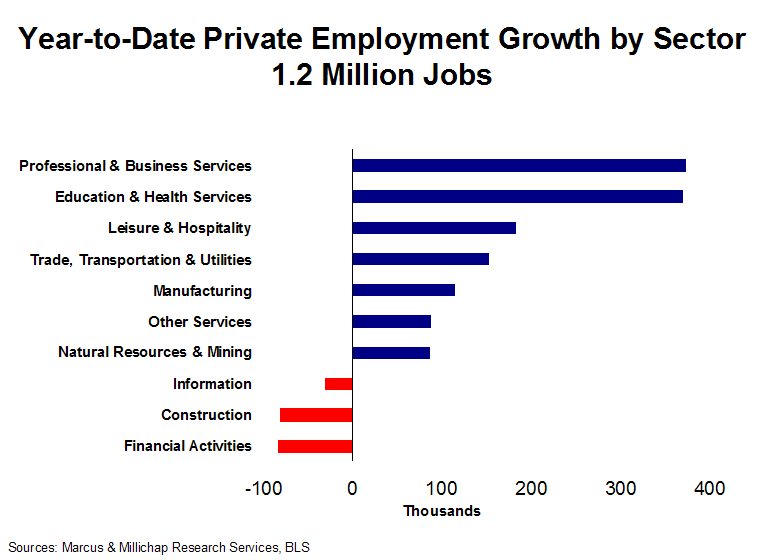 Led by growth in professional and business services, and education and health services, private-sector employment recorded its eleventh consecutive monthly increase, offering promise the economy will continue to make gradual progress through the holiday season. Year to date, the private sector has added 1.2 million jobs, a remarkable achievement compared with the calendar year following the last two recessions. In the first 11 months of 1992, roughly 740,000 private-sector positions were added, while employers shed 610,000 jobs during the same period in 2002, despite economic expansion. The professional and business services sector has led employment growth this year with the addition of 373,000 workers. This figure,however, obscures continued caution among businesses, as 83 percent of these additions, or 307,000 jobs, have been temporary hires. The education and health services sector, though, has grown steadily throughout the recession. Ongoing expansion of medical practices and the healthcare needs of an aging population spawned 369,000 jobs through the first 11 months, with continuing expansion highly likely. The unemployment rate rose 20 basis points to 9.8 percent during the month, as the pace of hiring remains too slow to absorb unemployed workers. An estimated 150,000 jobs must be added each month to keep pace with new entrants into the labor force. The subdued pace of the employment market recovery and the elevated unemployment rate will likely add new urgency to the debates on the Bush-era tax cuts and the extension of unemployment benefits. Local governments remain a significant drag on employment growth as municipalities and counties continue to pare staffing. Thus far in 2010, local governments have reduced staff by 238,000 positions, including 14,000 jobs in November. Until local public-sector budgets finish recalibrating to their new budgetary realities, growth prospects will remain dim. Federal and state staffing levels, in contrast, increased by 3,000 positions in November, elevating year-to-date gains to 18,000 jobs. So far this year, 49,000 full-time office-using positions have been eliminated, but full-time hires were positive in each of the last two months, the first consecutive monthly gains since 2007. The addition of 20,000 full-time positions in the past two months may not appreciably alter the near-term course of the national office market, as vacancy remains on track to rise 70 basis points this year to 17.7 percent. Until corporate confidence rises sufficiently to spur permanent workforce additions rather than adding temporary employees who occupy space already available, absorption will languish. This confidence should emerge by mid-2011, generating the gradual, steady backfilling of empty cubicles and positive absorption of office space in several markets. The trade, transportation and utilities sector also continues to expand, as 153,000 workers have been added year to date. Improving retail sales increased the flow of goods from docks through warehouses and distribution centers and on to retailers and other end users, generating increased support for employment in this sector. Expanding payrolls represent an indicator of stabilization in the warehouse and distribution segment of the industrial sector.Through the third quarter, national industrial vacancy inched up 30 basis points to 12.9 percent, but the entire gain occurred in the first quarter. Positive net absorption of 6.8 million square feet was recorded in the ensuing two periods, holding vacancy level. This entry was written by marcusmillichap, posted on December 7, 2010 at 2:49 am, filed under Research and tagged Employment. Bookmark the permalink. Follow any comments here with the RSS feed for this post. Trackbacks are closed, but you can post a comment.